Want to get more engagement on Twitter? Did you know Twitter has a tool to help you analyze your tweets? Knowing which tweets have generated strong engagement in the past helps you craft better tweets. In this article I’ll explain how to analyze your tweets’ performance to improve your Twitter marketing. 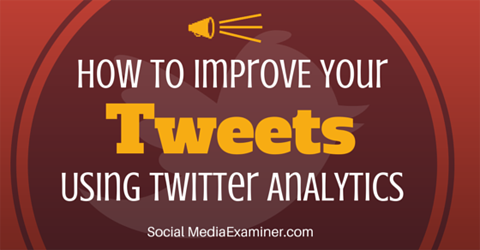 Find out how to improve your tweets using Twitter Analytics. 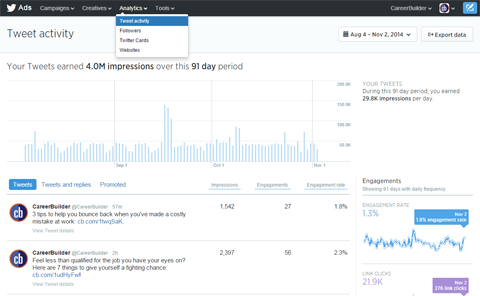 You don’t need to create Twitter ad campaigns to access the data in Twitter’s native analytics tool. If you have a Twitter account, then you have a Twitter ads account. Simply go to http://ads.twitter.com/, and sign in with your regular Twitter credentials. 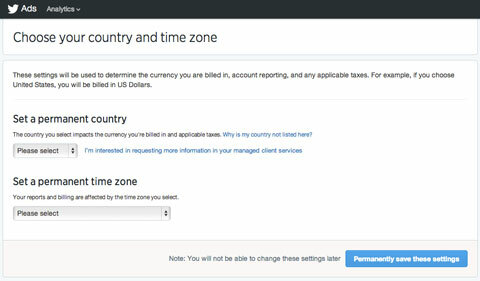 The first time you log in, you’ll have to set your country and time zone (these settings cannot be changed). The first time you log into Twitter ads, set your country and time zone. Once logged in, go over to Analytics and then scroll down and click on Tweet Activity. Your tweets for the last 28 days, as well as the number of impressions, engagements, link clicks, retweets, favorites and replies, will automatically appear. 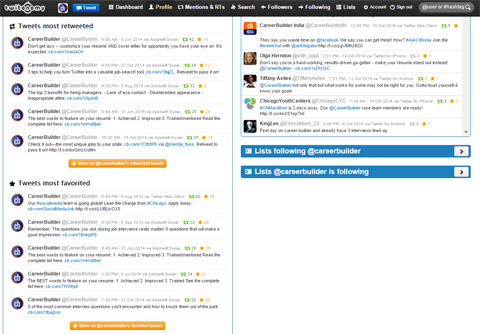 The example below shows the tweet activity for @CareerBuilder. Once logged in, you’ll see your tweets, as well as the number of impressions, engagements, link clicks, retweets, favorites and replies over the last 28 days. Now, change the date range. You can go back 13 months, but you can only see 92 days at a time. Note: If you have a more robust third-party app, you can see farther. Adjust the date range to view 92 days of data, the maximum allowed. There is a lot to see natively through Twitter ads, but the real power comes after you export and analyze the data, track trends and discover where your biggest opportunities lie. Click the Export button in the top right corner of your window just below your Twitter icon. Select the first batch of 92 days and click Export Data. Adjust the date range to the next batch of 92 days. Repeat until you have at least a year’s worth of data downloaded. Then open up each Excel file. Choose one as a master file, and copy the rest of the data into it. Be sure to remove the title rows from your other copied tweets, so there’s just tweets and data with only one title row. To make the file easier to work with, freeze the top row. First, click on the View tab and find Freeze Panes. Click on it and then select Freeze Top Row. Now you can scroll up and down, and keep the titles at the top. Freeze the top row to make your data easier to review. Once you have a master file of all of your Twitter data for a year, look at what the data has to say. It’ll tell you the best time to tweet to reach the most people, the types of tweets that consistently get the most engagement from your audience and exactly how many engagements your account has gotten in the past year. To find the best time to tweet, go into your master file and sort your data from most to fewest impressions. Highlight the Impressions column and go to the Home tab. There, usually on the far right side, is the Sort & Filter icon that looks like a funnel. Click Sort the entire sheet from Largest to Smallest. For those with a newer version of Excel, it’ll ask if you want it to sort just the column or the entire sheet. Select the entire sheet. If you have an older version, you may need to select the entire sheet and then choose the column to sort from the drop-down. Highlight the Impressions column and then sort to find what times get the most engagement. Once you have reordered your data, you’ll find the dates and times of the tweets that got the most impressions (the ones seen by the most people in your audience). If you see a trend based on day of the week or time of day, you have found the peak times for your tweets to go out to be seen by the most people. Review the top 50 or 100 tweets, and you’ll most likely find at least a few time trends. Note: You need to tweet consistently to get an accurate assessment. Now that you know when to tweet, do a similar sort on the Engagements column to see what types of tweets your audience likes the most. Twitter defines engagements as retweets, replies, favorites and any kind of click. The more actions a person takes after seeing your tweet, the more successful you were at reaching your audience. Trends in engagement levels will tell you what types of messaging and content your audience prefers. Highlight the Engagements column and sort the sheet so that the largest amount of engagement is on top. If you want, hide the Time and Impressions columns, so the corresponding tweets are right beside the numbers. This part is a bit more manual and qualitative, but it’s worth it to know which type of messages resonate with your audience. Review the top 50 or 100 tweets or whatever number makes the most sense for you. If you can see a trend with fewer tweets, good for you. 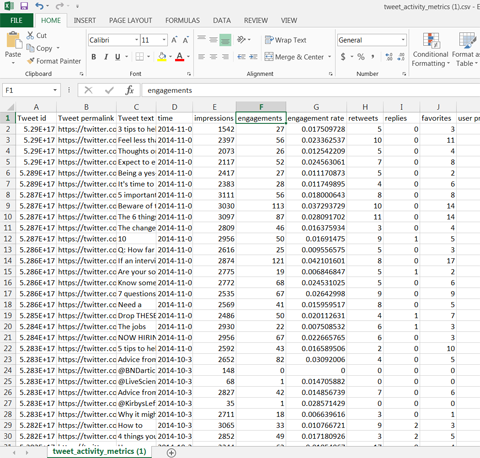 If you have the time and really want to be thorough, by all means dive deep into that data have a swim around. Twitter ads will help you discover how to leverage your past success to accomplish more in the future. If you still need more insights, here’s another free tool to explore. Twitonomy will help you see what competitors and influencers in your industry are doing on Twitter. Twitonomy allows you to browse, search, filter and get insights from the people you follow and those who follow you. This tool has a premium option, but there is a lot you can get out of the free version. 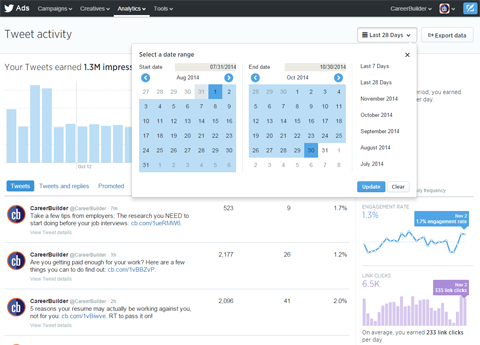 Twitonomy is a free tool that helps you analyze competitor data. Go to Twitonomy.com and sign in. It will ask you to authorize the app through your Twitter account. 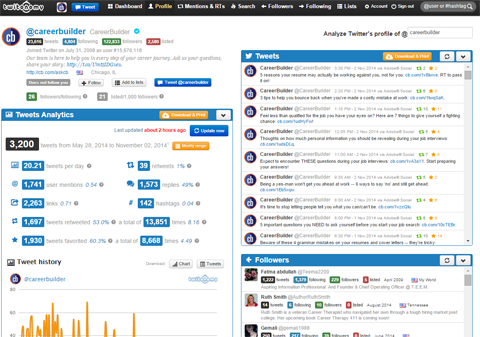 Once you’re in, click on the Twitter Profile tab at the top of the screen to view in-depth analytics on your account. Once you log in, click on the Profile tab and Twitonomy will analyze your tweets. To see competitor accounts, all you have to do is type in a different Twitter handle into the top right corner of the screen, next to where it says “Analyze Twitter’s Profile of @_______” and hit enter. When you do this, you can see exactly what works best for others in your industry. In this view you can see whom they connect with the most, what hashtags they use, what types of tweets they send out, when they tweet most often and more. In addition to competitors, research influencers or top customers you want to learn more about. Scroll down the page to find Tweets Most Retweeted and Tweets Most Favorited. These top five tweets will give you a good indication of what type of content their followers connect with. Look even further down to view the days of the week and hours of the day chart. While it doesn’t show you the times their tweets get the most impressions or engagement, it does show when they tweet the most. This can offer good insights as well. Now that you’ve cracked the code for what your audience wants and when they want it, craft effective Twitter updates and schedule them for the best times. Twitter ads and Twitonomy are helpful and cost-effective. Find time to go through these reports to see what works for you and your competition. The improvement in results from your Twitter marketing will be worth it. Once you get comfortable with this kind of data review, check back every week, month or quarter to make sure that you are still hitting the optimal mark. The social media world moves fast, and analytics will help you keep pace with the changes. What do you think? Do you check your Twitter analytics? What tools do you use to analyze your tweets? What analytics do you find most helpful? Please share your thoughts and recommendations in the comments.